Outstanding for fabrics and wood . . . also good for ceramics, china, leather, tile, brick, paper, some plastics, and other surfaces. Comes with a pointed tip for precise application. 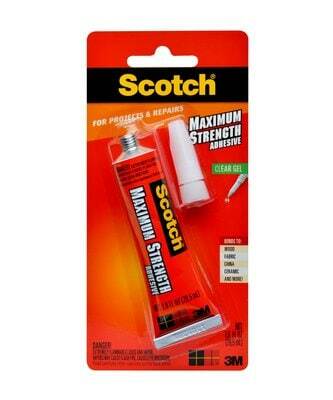 Scotch® Maximum Strength Adhesive is our most durable super strength adhesive. It works on the widest variety of surfaces. Clear and highly versatile. Outstanding for fabrics and wood. Also good for ceramics, china, leather, tile, brick, paper, some plastics and other surfaces. Comes with a pointed tip for precise application. Easy to use, and non-stringing. This glue gel is our most durable super strength adhesive, and it works on the widest variety of surfaces. Clear and highly versatile. Outstanding for fabrics and wood . . . also good for ceramics, china, leather, tile, brick, paper, some plastics, and other surfaces. Comes with a pointed tip for precise application.